This text, volume I of a two-volume work, examines in depth the standard (also called classical) propositional logic. This is a theoretical work that aims at a philosophically exploratory and technically rigorous presentation. Detailed examples and exercises are used to tease out technical minutiae, solidify understanding, and point to logical-philosophical puzzles and challenges; because of this feature, the text can also be used to study formal logic in a rigorous fashion. 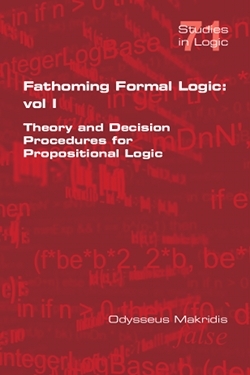 The study of propositional logic can reward the dedicated and patient student by unveiling technical mysteries of critical thinking and problem-solving, by shedding light on relevant concepts in the study of reasoning, by showing how the powerful formal tools and methods work in applications, and by unlocking the crypts of logical analysis. It can hone insights that further contribute both to understanding how logic works and to preparing for future pursuits in the study of formal reasoning. This text encompasses certain topics and decision mechanisms that are usually absent from Logic texts and can be canvassed only through acquaintance with ever larger chunks of the extant bibliography. Rarely covered topics of the present text include: possible-worlds analysis, analyticity and non-cognitivism, detailed investigations of logical relations, alternative grammatical and computational systems, truth tables for dynamic flow of information and corrected truth tables, negative and positive semantic trees, normal forms and Karnaugh maps, Intuitionistic natural deduction, normalization and harmony in proof-theoretic systems, and dialogical logic.